24 Techniques for Closing the Sale – DVD video – discount! Learn how to be an excellent closer! Research shows that most salespeople spend long hours getting to know their product or service, prospecting, cultivating the right customers, etc. But, few take the time to learn effective closing skills. One reason why so many sales interviews end in NO SALE is that the salesperson fails to even attempt to close the deal. 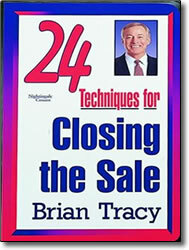 Here are Brian Tracy’s 24 proven, powerful closing techniques that will help any salesperson close even the most demanding customer. Great for sales meetings. Close the sale every time, in every situation! In this video presentation, Brian Tracy reveals 24 fool proof closing tactics for constantly pushing a customer’s “hot buttons.” Discover the magical effect of constrained enthusiasm, best time to close a sale, the fail-safe way to detect why a prospect isn’t buying, and more! Hi, I really liked your 24 Techniques for Closing the Sale – DVD. I am from India, Goa.